Even though college enrollment rates among young people have risen in recent decades, a Pew Research Center analysis of U.S. Census Bureau data shows that females outpace males in college enrollment, especially among Hispanics and blacks. In 1994, 63% of recent female high school graduates and 61% of male recent high school graduates were enrolled in college in the fall following graduation. By 2012, the share of young women enrolled in college immediately after high school had increased to 71%, but it remained unchanged for young men at 61%. A similar pattern is seen among young Hispanics. In 1994, among Hispanics who completed high school, about half of men and women immediately enrolled in college. Nearly two decades later, college enrollments for both groups improved, but women outpaced men by 13 percentage points. For black high school graduates, there’s a different story. In 1994, young black men were more likely than young black women to be enrolled in college immediately after high school. By 2012, the pattern had reversed: The share of young black men enrolled in college remained stagnant, while the share of young black women enrolled in college increased to 69% —a 12 percentage point gap with black men. It’s worth noting that the backdrop to these shifts is the changing demographics of the nation’s public school student population. In 2012, 25% of all public school students were Hispanic while 16% were black, 8% Asian American or Native American and 51% white. By comparison, in 1994, Hispanics made up 14% of public school students, blacks 17%, Asian Americans and Native Americans 4% and whites 65%, highlighting the growing impact of the nation’s non-white students. Many scholars have offered reasons for the widening gender gap in educational attainment. Some have pointed to economic factors—as labor market barriers to women have been lowered, the benefits of a college education grew more for women than men. Others say the higher incidence of behavioral and school disciplinary problems among boys may be a factor. Citing some of these findings, last week President Obama announced a new initiative, called My Brother’s Keeper, that aims to empower young black and young Hispanic men, focusing on improving educational attainment and employment prospects while reducing involvement in crime. Even so, the growing gender gap in college enrollment is not limited to Hispanic and black youth. In 1994, among high school graduates, 62% of young white men and 66% of young white women were enrolled in college immediately after graduation—a four percentage point gender gap. In 2012, that gap had grown to 10 percentage points as the share of young white women enrolled in college grew to 72% while the rate for men remained the same. 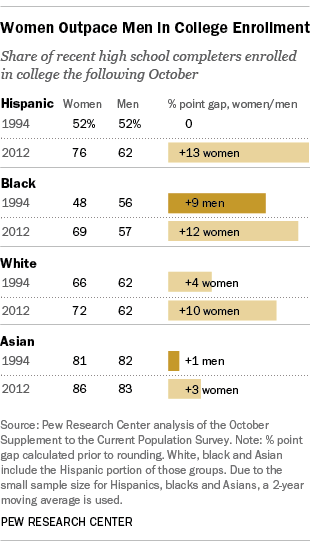 Among Asian Americans, there’s been a less dramatic shift. Among them, the share of high school graduates going to college immediately after graduation also grew during this time period for both young men and young women, but the gap is much smaller than that among other groups.